Glory of the Stars: A Spirit Among Spirits: King, Concierge, Roommate? A Spirit Among Spirits: King, Concierge, Roommate? I was reading Facebook today and I saw a post about a spirit working someone intended to do. I don't really know this person, and as I understand it they are an experienced and competent magician, so the questions that sprang to my mind were not necessarily really about this person and their intentions so much as just those inspired by the idea of this particular working in a vacuum. At the end of the day, some of my questions were interesting for me to think about, but I'm not part of the tradition of that spirit so they're not really relevant for me to talk about. There was one though that stuck with me, one which works as a general question beyond any particular spirit or tradition. Not only did the question stick out to me, but during the course of the day someone reached out to ask about a previous post that connects to this question. We've talked before about intermediaries and spirits who give introduction. This is somewhat related to that idea, in fact very related to that idea, but it also goes further. An intermediary spirit might be a spirit that opens a particular pathway or kingdom and allows access to the spirits within that domain, and may also allow them access to work in the world. An introducing spirit is a spirit with whom you have a working relationship who facilitates work with spirits with whom you do not yet have a working relationship, they're your inside man, or your guy who knows the guy. The intermediary could also be your introducing spirit, or you might work with separate spirits in this role. When we talked before about your “first spirit” or the initial spirit with whom you have contact, who may even be the spirit that brings you into magic, a large part of that spirit's role was as the introducing spirit. Depending on the work you're doing it might still be that first spirit, or it might be a spirit attached to you by initiation, or through some spiritual or magical process, or it might be a different spirit or group of spirits depending upon the work you're doing. Depending upon the spirits you're working with, or the type of work you're doing, there may be two other jobs that these spirits may take on, or perhaps they won't take these jobs on, perhaps you'll need another spirit to do these jobs. The jobs in question aren't ones with fancy classic names, but we can think of one as a mediator or translator, and the other as a kind of organizer or project manager. The mediator or translator functions to facilitate a comprehensible interaction with the spirits with whom you're working. Often this is your possessing spirit if you have one, the spirit who can sit with you and whisper directly to you guiding you and interpreting for you. In this context the idea is that you may not fully comprehend directly what a spirit is saying or communicate directly in a way comprehensible to the spirit, and so this mediating spirit allows for that communication. This idea isn't really explored much in Western magic. But it's a pretty good idea, and I think it's often there in Western Magic without us necessarily understanding it. Generally in grimoire magic this would be described as Divine Wisdom, the Holy Spirit, The Holy Guardian Angel, or the Spiritual Assistant. In the Greek Magical Papyri there is a good example of this in which one essentially conjures “the light” as the means through which to make the conjuration of the spirit in question, and the light is clearly needed to interact comprehensibly with said spirit. The Sacred Magic hints at the idea in that it doesn't really tell you how to call on or command the demons, just that your angel will tell you how to do it and what to do and what to say and basically facilitate the process. So when working with a spirit, whatever spirit mediates for you would sit with you and assist in communication between you and the spirit. Depending upon the relationship you could perceive this directly, or perhaps it would just work like a lens and you wouldn't see a process to it. Engaging this relationship though would be part of entering into the magical space for your work, just as would your ritual purification or putting on your robes, in fact, in early grimoires a series of angels are called upon as one dons the robe, or the garments of salvation, highlighting that an immersion within spirits is part of the process of entering into the work. If you communicate through divination your spirit would be the spirit who sanctifies your divination space and tools and allows them to speak truly for you, creating the space in which the spirit being called can enter and speak and have their answers translated into your tool. When the spirit is functioning to organize or be a project manager of sorts it is coordinating your efforts with the spirits, and perhaps other magical efforts as well. Fr. Rufus Opus wrote a piece on this for Zero = Two called “The HGA: Chef to the Gods”. In this he talks about how the Holy Guardian Angel, and other spiritual assistants, understand what is pleasing and what is not pleasing to other spirits you might choose to conjure. Like the role of an intermediary in facilitating communication the intermediary can facilitate the etiquette of the interaction. Beyond this, the intermediary can help in bringing spirits. The spirit in this coordinating role can also help in identifying what spirits you should work with on a particular task. When working with my ancestors this happens somewhat regularly. I'll ask for help with a problem and they'll tell me to conjure a particular spirit with them so they can help with the interaction. In all such instances the idea of conjuring a spirit wasn't one that was on my mind, but it ended up being a good choice. Recently I was considering a conjuration and my ancestors advised me to work with them in going through the Book of the Offices of Spirits to select what demon to call. Allies in the spirit world who know the spirits and know your needs can guide you in what spirits to bring into your life. In my story about car trouble, my ancestors, and the archangel Raphael were involved to help mediate the forces and guide the efforts of the other angels and aerial spirits I had called upon. So in addition to guiding you on what spirits to work with, those spirits with whom you have a close relationship can also help guide the interaction and coordinate the work of the other spirits you're working with. Consider a situation in which you need a job. You go to your Holy Guardian Angel, or your ancestors, or Hekate or whatever intermediary or ally you have and ask what you should do. They direct you to a spirit under the rulership of Jupiter, another under the rulership of Mercury, one under the rulership of the Sun, and the gnomes. You conjure each spirit and describe your desire, each being conjured with your intermediary also having been invoked. Your intermediary guides the Jupiterian spirit to help establish fecundity and prosperity in your life, the Mercurial spirit works to improve the reception of your resume and your ability at interviews, and inspires call backs, the Solar spirit provides a sense of honor and dignity when interviewers look at you, and the gnomes build the actual manifestation of the job from the conditions the other spirits move in your favor. You could do one conjuration of one spirit and it could work towards what you want, and it could be successful. Or you can coordinate an effort on multiple fronts and increase the options for the best result. Different forces each working on their own for a goal uncoordinated may have elements that you don't want because they're not focused, or it may have spirits working in ways that compete against each other, or which work in parallel but don't work together. Having a spirit who helps coordinate that interaction allows them to actually work together, focused on their particular domain, in a way which directs their efforts specifically in the way needed rather than on generally adding their influence to a particular area of your life. When working in this manner your spirit can also help coordinate offerings you make in thanks. Again, in Rufus's example he makes the case that your Holy Guardian Angel can set a banquet for the spirits, but another way to look at this is when you set offerings for the spirits you've worked with, the spirit who you approach to guide that work can also help facilitate all the spirits receiving the offering together, so that you can make one rather than many. If you need to make separate offerings, your spirit working as your point of contact, can also instruct you in that. So what spirits serve this role and how do you develop that relationship? Ultimately this is a spirit relationship which is on going and personal. It's not a spirit relationship that is always about getting something specific. Sometimes interaction with these spirits will be about the interaction and developing the relationship. There can be a benefit to this being a “head spirit” or “possessing spirit” one that sits with you and works with you even outside of ritual work, especially if the spirit is helping you speak with other spirits. Depending upon the type of spirit though it might be one with a more ritual based relationship and interaction. In any case it should be a spirit where your relationship with the spirit is such that it will have an awareness of your needs and will understand you. An easy relationship to develop in that regard is with your ancestors. They already have an interest in you and are often open to making a connection. If you're working in a system drawn from the grimoires or systems of Western magic then the Holy Guardian angel can function in this capacity. The spiritual assistant of the Greek Magical Papyri, or some types of familiar spirits can also serve these purposes. We can look at crossroads spirits like Hekate for this, particularly ones like her since she has power in all areas of creation, in my experience the directional kings would not serve in these roles in the same way, unless you're coordinating work only in a singular kingdom. In traditions like Quimbanda the Exu and Pomba Gira to whom you are connected primarily would serve in these purposes, and as I understand it, these functions are built into that tradition with these spirits. I would imagine other African Diaspora traditions have similar systems in place in which your main spirits assist in interfacing with other spirits. 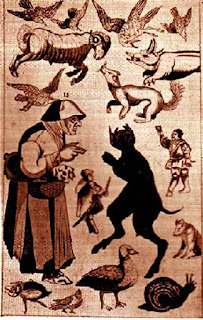 Looking at those traditions, looking at the role of the familiar in traditional European witchcraft and in Greek sorcery can guide us in how to approach spirits as part of a living world rather than as a static system of tools, which has unfortunately been a fairly present perception in established modern ceremonial magic...but, it's one which is fortunately changing as more magicians engage with the spirit world. If you enjoyed this please share, also, follow us on Facebook!